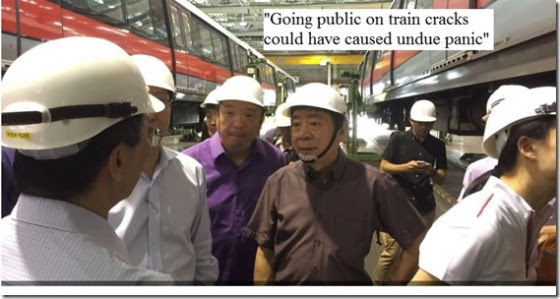 I just read Khaw BOON Wan’s explanation about why the authorities did not disclose the cracks in the trains to the public. Because he doesn’t want the public to “panic”, Mr Khaw said. I think it’s a sound decision. As sound as Mr Tharman Shanmugaratnam saying that the govt cannot disclose why Charles Goodyear left Temasek even though “there is public interest”. As sound as how Ho Ching’s salary cannot be revealed (when even the Prime Minister’s can). As sound as how Lawrence Wong said the govt cannot release secret Cabinet Papers from 50 years ago because “it will not lead to good governance”. As sound as how PAP town councils did not disclose investments in toxic financial products until Lehman Brothers collapsed; or how the PAP did not disclose it owned a private company to which PAP town councils sold an entire computer system they had created with residents’ money. As sound as the SMRT itself using cable ties to secure the “claws”, or metal grips, which had become dislodged on the tracks. A fact which only came to light during an investigation. And finally, as sound as the complete silence from the man directly responsible for this latest incident – Desmond Kuek. Khaw Boon Wan’s explanation makes perfect sense – if you believe the public does not need to know these things and if you worship ‪#‎OwnselfCheckOwnself. Such secretive decision making will benefit Singapore immensely – when the govt finally decides to build nuclear power plants here – “superficial hairline cracks” and all. Republished from Andrew Loh’s Facebook with permission.